Looking for a fun activity for music centers? These matching games are perfect! I use them all year, and my students enjoy them, even though it requires them to know the information! It also allows me to walk around during music class and assess their knowledge of the activity. All you have to do is print, laminate, cut, and go! This is a growing bundle. You pay for the current resources, and I will add more as I create them. That means that you will get FREE RESOURCES-- and that the price will go up as more resources are added, so get it now! 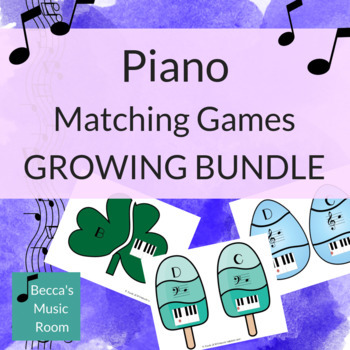 Matching games are available to recorder, piano, treble clef, bass clef, rhythm, and instruments of the orchestra. The piano matching games allow students to match piano keys, letters, and notes on the staff. Many of them also have a way to just have students match two of them-- like piano keys and letter names. This is a great way to differentiate! In some games (like the snowmen), you can simply leave a part out. In others (like the Easter eggs), there are separate pages that can be printed. This bundle currently includes $24 worth of resources for $18. That's two free resources!